This year, skip the hoo-ha of Valentine’s day and stay in, and make the night special by cooking your own romantic dinner together. We’ve put together a simple menu that features some delicious dishes that are easy to prepare together as a team and will keep you both busy in the kitchen. This menu is fun and easy enough to ensure that no plates end up being thrown – we hope! LET’S START WITH A DRINK SHALL WE? It is, after all, a celebration of your love and no celebration would be complete without something bubbly. The French 75 is a classic cocktail, made traditionally with gin and champagne but we’ve reworked this one slightly to better reflect the loved-up mood of the evening. This version features pink gin from Hope on Hopkins and grapefruit juice in place of lemon (check out these other local craft gin options). 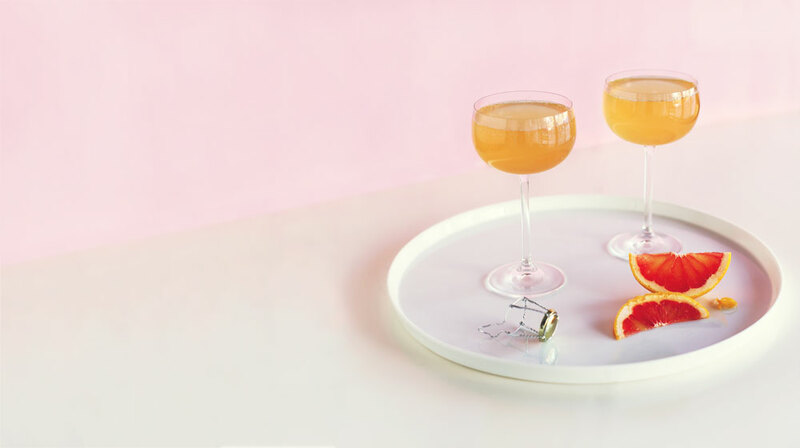 The result is a rose-coloured drink that is tart, sweet and sparkly in all the right places. Be warned, though, this drink is rather potent, so maybe don’t drink more than two if you plan on cooking the rest of this meal successfully. Right, now you’re all loosened up, it’s time to move on to making some food. 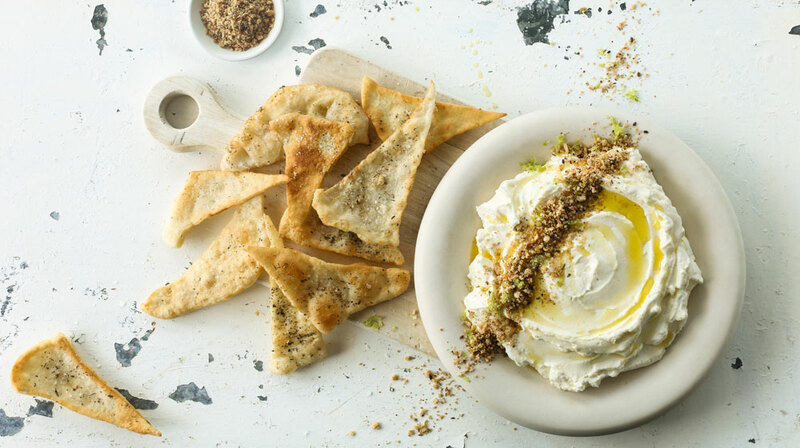 This dish of Labneh with Dukkah and Flatbreads is the perfect way to kick off a meal for two. It’s also cleverly prepared in that you’ll need to start hanging your yoghurt a couple of days before you wish to serve it. This means on the night of Valentine’s you can just prepare your dukkah and make your bread. Easy peasy. 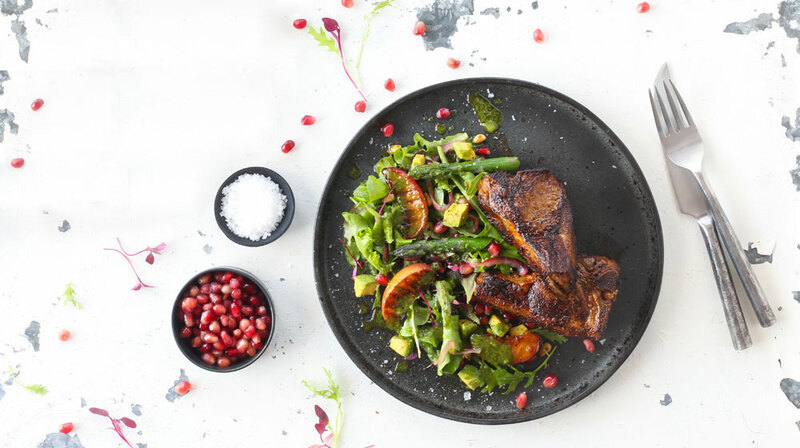 For mains, you’ll be cooking these gorgeous Harissa-marinated Lamb Loin Chops and serving them alongside this refreshing Grilled Peach Salad. The marinade itself is easy to throw together so you and your significant other can make it on the night. But, if you’re looking to streamline your evening, make it the night before and pop the chops in it for a couple of hours before you want to serve them. The salad will require a little bit of prep but will take you no time at all if your paramour helps you. This veritable feast that you’ve put on will have to eventually end. 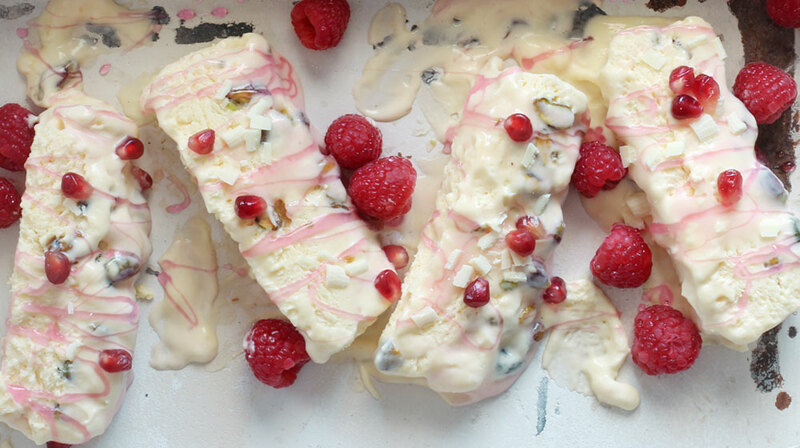 Luckily, though, the ending will be a sweet one with this White Chocolate Semifreddo with Pistachios and Rose Syrup. This is also a cinch to prepare, it just needs overnight freezing time, so you’ll be able to pull it out of the freezer once you’re ready for it. By this stage of the evening, we imagine that you will be quite full and wouldn’t have listened to our advice on the Pink French 75 (we told you not to drink more than two!) so you’ll be able to relax and simply enjoy your dessert, without any work necessary. Need some bubbly to go with your meal? Check out our top MCC and Champagne picks for 2019. I wouldn’t be Valentines Day without a good dessert.